One of the things I have found useful when working in my day to day job is to try to think about old games I played as a designer. It is fun and enlightening to try to figure out how or why the creators of a game took one decision or another. From time to time I will publish some of the small analysis' doubts and comments that I have about many oldies and personal favorites. I will start with something simple, the description of the behaviour of a regular enemy that got me excited the first time that I saw it: Berserkers from Gears of War. are blind help them utilize their other abilities. Their uncanny and lethal behavior makes them terrifying enemies to combat that the player must pay attention to their every move. 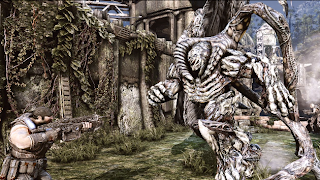 The first time a Berserker appears it is explained to the player that he must use a different technique to destroy them. Then to further reinforce the idea that this enemy is brutal and unstoppable, we are show a violent cut scene. find that you are able to kill the monster by making it fall from the fast moving train cars. In any case, the methods to get rid of them is unique and imaginative. It involves the use of special weapons and oppressive environments that one must overcome. The design of these monsters make them feel special and interesting, not just cannon fodder that slows the player down.